I enjoy cooking food, and eating it too. I found this recipe browsing the My Recipes site. I needed something to do with my chicken breasts, but wanted to try something new. The recipe is originally from a popular "light" cooking magazine, and it got great reviews so I decided to try it out. I'm so glad I did. The flavors were fantastic, and even Chad was surprised (he's not a fan of coconut) and delighted. 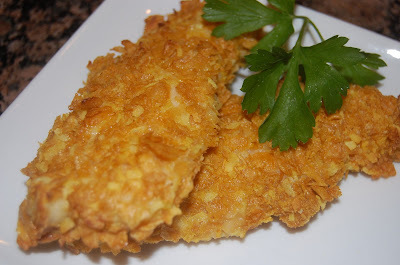 The corn flakes added a crispy crunch, and the curry powder gave it just enough heat. I was skeptical about baking the strips and them coming out crispy, but they did, and what a great way to cut fat and calories. Here is the recipe with my modifications. Preheat oven to 425; line a cookie sheet with foil and spray with butter spray. Combine chicken and buttermilk in a dish; cover and chill at least 1 hour. Drain chicken, discarding liquid, but do not rinse. Combine chicken and flour in a medium bowl, tossing to coat. Combine egg and egg white in a small bowl. 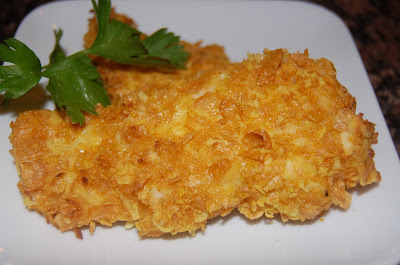 Combine crushed cornflakes , coconut, salt, curry powder, and garlic powder in a shallow dish. Dip strips into egg mixture, then dredge in cornflake mixture. Lay on foil lined cookie sheet. Repeat procedure with remaining chicken, egg mixture, and cornflake mixture. When all strips are breaded lightly spray with butter spray. Cook on middle rack of oven for 8-12 minutes. This looks great, I love coconut! and I bet the flavours are equal. 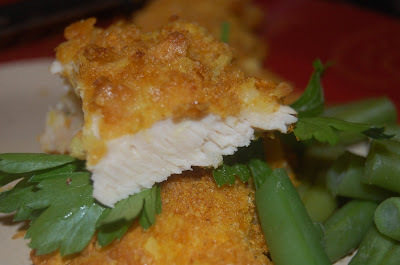 This looks like perfectly crusted chicken and I'm sure it's flavorful too! OH MY GOSH this looks amazing!! Totally starring it...I LOVE coconut and I'll bet it pairs perfectly with the chicken...and the crust looks perfect! Yum - this looks fantastic. I love using buttermilk with chicken. I'm bookmarking this one! these sound delicious! I bet the buttermilk made the chicken very tender. one other thing - I think you may have accidently left the flour out of the ingredient list? It's noted to toss the buttermilk-marinated chicken with flour, but I don't see how much!